The Attends Contour Regular pads are a diverse range of body shaped pads, including different absorption levels to choose from in order to cater to your level of urinary or faecal incontinence. Levels 4-5 are ideal for moderate incontinence, and levels 6-10 are ideal for heavy incontinence. Advantages of the range include the natural Odour Protection Range, which serves to reduce the risk of unpleasant smells and will keep you feeling confident throughout the day. The range also includes advanced technology with the addition of the curly fibre acquisition layer, helping to guarantee a low pH in order to protect your skin and ensure improved skin health so you can relax knowing your skin isn't at risk of harm. Additionally, the pads also come with Quick Dry, which is an effective acquisition layer, placed directly below the top sheet where the urine enters the pad. The layer cleverly absorbs urine away from the skin and into the pad, resulting in prevention of any urine returning to the surface. 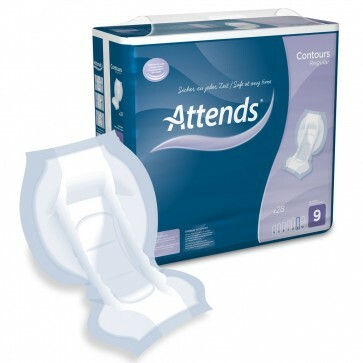 If you have moderate or heavy incontinence and are looking for a pad with features that will help ensure the pad is as discreet as possible, our range of Attends Contour Regular pads may be the ideal product for you. In order to ensure maximum performance and greater comfort Attends Contours should be worn alongside the Attends Stretch Pants.